AquaLife WIZARD Algae Scrubber Pad Blue 3" x 4"
Aqua LIFE algae scrubber pads can give the aquarist the upper hand when trying to clean an aquarium of algae build-up. One of the toughest jobs in the aquarium hobby for the aquarist has to be cleaning algae off of viewing windows and in-tank ornaments. The Aqua LIFE algae scrubber pad can cut down the time and effort it takes to clean an aquarium from hours to minutes with these amazing pads. The Aqua LIFE algae scrubber pads come in two different types, a blue pad for glass aquariums and a white pad for acrylic or plastic tanks. The blue pad has a slightly more aggressive nap which can scratch acrylic tanks or tanks that are made with plastic, so only use the white pads for acrylic. After heavy algae fighting use the pads may load up with algae, making it harder to clean aquarium walls. It is a good idea to rinse the pads out to rid them of loaded algae. Always check the pads for gravel or sand before use, as this will scratch any surface being cleaned. 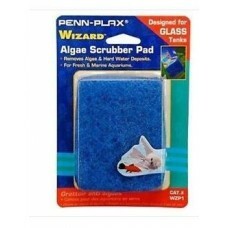 The Aqua LIFE algae scrubber pads will give the aquarist long lasting usage and durability. 3" x 4" x 0.5"